Stats: Fermento-Tainment! 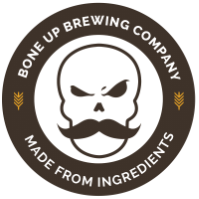 - Bone Up Brewing Co.
Color: The same color as the fallen leaves lining the forest floor. Best Occasion to Drink: At our birthday party while you're listening to The Weisstronauts! Brewers' Notes: Despite all the time we've spent coming up with music pairings for beer, up until a recent interview we'd never thought of flipping that script and making a beer to pair with music (though like all great ideas, it seems obvious in retrospect). Then, after instantly and unanimously deciding that The Weisstronauts would be the best band to base a beer on, we went and did that thing I just said! And so, not unlike the album we shamelessly stole the title from, Fermento-tainment has an easygoing nature that belies its complexity. You won't be disappointed if you just go ahead and drink it, but you'll be rewarded if you focus up and dig a little deeper.